The best chilaquiles I ever had in Mexico were in a hotel in San Miguel de Allende. I was spending the weekend there with my family thirty years ago, and after his morning swim in the hotel, my dad asked for chilaquiles rojos for breakfast near the pool. The waiter brought them in a small covered clay pot and when he took off the cover, there they were, crispy with a perfectly spicy red salsa topped with the right amount of chicken, Mexican crema, queso fresco and a fried egg on top. I’ve returned to that hotel many times over the years and always ordered the chilaquiles rojos trying to relive that memory, but they were never quite the same. This recipe is as close as I can get to that perfect dish that still lives in my mind. To prepare the salsa: cut the top of the dried guajillo pepper and discard the seeds. Toast the dried pepper slightly in the skillet or comal for a couple seconds on each side, and place in 4 cups of boiling water to rehydrate for about 15 minutes. Roast the tomatoes on a skillet or a comal, and turn often to charr them in different spots until they are oozing and black in some spots. Transfer to a blender along with hydrated pepper, salt, and 1/4 of the onion slices. Blend for 5-10 seconds. Fry 1/2 of the onion slices in olive oil until tender. Add the salsa and mix well. After 3 minutes, add cilantro leaves, lower the heat to low, and let it simmer for 20 minutes. Season with more salt to taste. Once the sauce is ready, fry the tortilla squares in a skillet with the vegetable oil until crispy (you can use stale tortillas by leaving out the cut up pieces out on the counter the night before, or by heating up the tortilla pieces in a comal or skillet before frying them; using fresh tortillas out of the fridge and frying them will not produce crispy tortilla pieces). Add the hot red salsa until the tortillas are fully coated with the sauce. You can add less sauce if you want them less soupy. Serve the chilaquiles rojos in a large platter, or in individual clay pots, garnished with the shredded chicken, the remaining sliced onions, crumbled Mexican queso fresco, and drizzled crema. 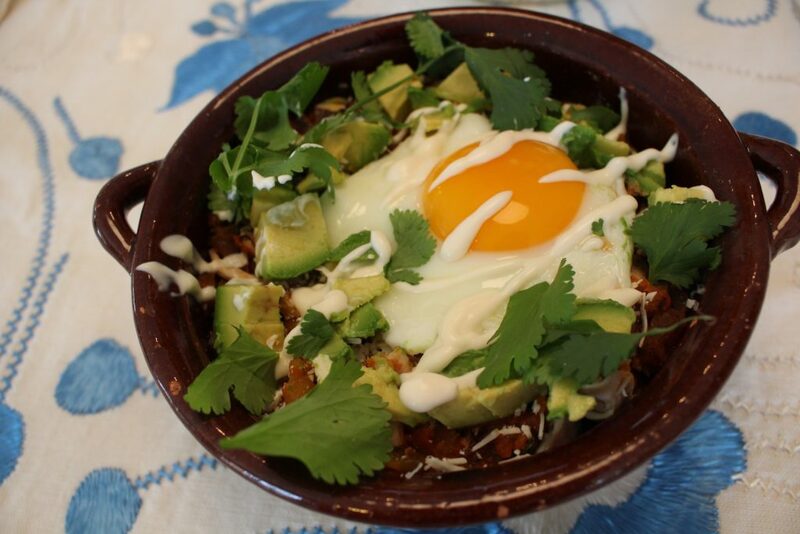 Garnish with cilantro, avocado and a fried egg on top. Eat immediately if you want them crispy, or let them sit longer if you like them a little more tender. Note: The tortillas I use are from La Poblanita, which I find are the most similar to the real Mexican tortillas. You can find all the necessary ingredients for this recipe at City Market in Norwalk. *Sorry no furry friends, per the health department.